Cardinals first baseman Luke Voit sent a fastball from Diamondbacks pitcher Robbie Ray directly back where it came from in the second inning of tonight’s game. Voit’s line drive (measured at 108 miles per hour) zipped straight at Ray’s dome, sending him sprawling to the dirt. His teammates and Voit immediately surrounded him in support and stayed for a few minutes before Ray slowly came to and left the game. Incredibly, Daniel Descalso actually caught the ricochet to make the out. We’ll update this post if more information on Ray’s condition becomes available. Update, 10:40 p.m. EDT: Ray has been hospitalized. Update, 7/29, 11:40 a.m. EDT: Ray received stitches and a CT scan which “checked out well,” per manager Torey Lovullo. He eventually made his way back to the stadium to shower and he’s in the concussion protocol. His teammates seemed pretty shaken by it all. Reliever Archie Bradley was one of those most affected. The right-hander was hit in the face by a line drive off the bat of Carlos Gonzalez two years ago. 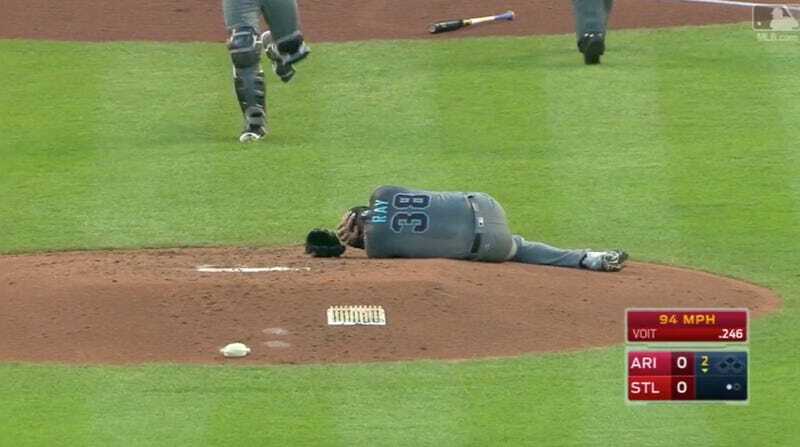 He was sitting in the bullpen when Ray got hit.